Understanding Alkalinity and its Impact on Reverse Osmosis Membrane Scaling - American Water Chemicals, Inc. The word “alkalinity” is probably one of the most commonly used in our industry. Reverse Osmosis (RO) and Nanofiltration (NF) plant operators have to measure the alkalinity in the feed to their membrane plant, as well as in the permeate and finished water. We all know that high alkalinity in the feed water can cause membrane scaling and that low alkalinity in the finished water can cause corrosion. But what does alkalinity actually mean? Since pH is a measure of the free acid (hydrogen protons) in the water, the pH of high purity water drops very quickly with acid addition. Ground water, which contains carbonates and bicarbonates that consume acid, requires higher amounts of acid to reach the same target pH. This resistance to pH change is commonly referred to as “buffering capacity”. Alkalinity is calculated by the amount of acid needed to adjust the pH to ~4.5 in groundwater (and pH 4.2 in seawater). 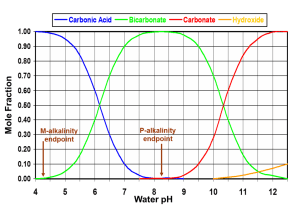 This is because the highest contributors to alkalinity are carbonate and bicarbonate, which are completely converted to carbonic acid (dissolved CO2) between pH 4 and 5. At that point, there are no longer any ions that significantly consume acid. Total Alkalinity is measured by acid titration of a solution to a pH of 4.5. Since a Methyl-Orange indicator is typically used to identify the end-point, we refer to this test as M-Alkalinity. This test accounts for all ions that provide buffering capacity to the water. In addition to carbonate and bicarbonate, ions with buffering capacity include phosphate and hydrogen phosphate (PO43- and HPO42-) at moderately high pH, and silicates and hydroxides (and borates in seawater) at very high pH. Alkalinity above pH 8.3 is measured by acid titration of a solution containing a Phenolphthalein indicator– it is therefore known as P-Alkalinity. This is primarily a measure of the concentration of carbonates being converted to bicarbonates, until carbonates are completely consumed by acid at pH 8.3. However, the P-Alkalinity value also gets impacted by other ions that react with acid at higher pH, including hydroxides, silicates, borates and phosphates. 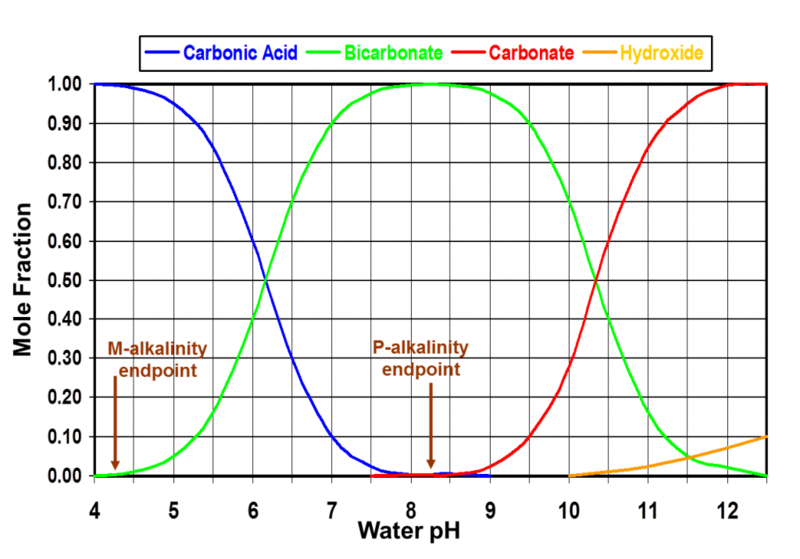 The P-Alkalinity is multiplied by 2 for a very simple reason: it takes two acid protons to convert each carbonate ion to carbonic acid, whereas only one acid proton is required to convert bicarbonate ion to carbonic acid. Since M-Alkalinity accounts for all alkalinity, we can calculate carbonates by subtracting the bicarbonate alkalinity from the M-Alkalinity. Although hydroxide ions (OH–) contribute to Alkalinity because they are acid consumers, they do not have a significant buffering capacity at pH < 11. Each ppm of OH– ion only adds 0.34 ppm of alkalinity as CaCO3. By contrast, each ppm of CO32- adds 1.67 ppm of Alkalinity and each ppm of HCO3– adds 0.82 ppm of Alkalinity (as CaCO3). Alkalinity is very important in NF and RO applications because it can increase the precipitation potential for carbonate scales. At pH above 8.3 where carbonates exist in significant concentrations, carbonate scaling potential increases significantly, as does the rate of carbonate scale precipitation. Although most antiscalant and membrane software projections only calculate saturations and precipitation potentials for calcium carbonate, there are many other types of carbonate scales that can form. These include magnesium carbonate, barium carbonate, strontium carbonate, ferrous carbonate and manganese carbonate. As a matter of fact, in a typical RO system operating below pH 9, manganese carbonate is more likely to be a scale former than manganese hydroxide or manganese dioxide, even when high levels of dissolved oxygen are present (assuming there are no strong oxidizers like chlorine in the pretreatment).